At some point I’ll have to return to researching my direct line ancestors. But for now, my interest lies with Emile Schmitt, my second great-grandmother’s brother. After my last Emile-related post, a genealogical angel (I’ll call her Betty) sent me a baker’s dozen of Cincinnati Enquirer articles written about Emile and his wife. Thank you again Betty – your kindness is very much appreciated! And thank you to the Kenton County Public Library for making these articles available online. The obituary to the left is one of my favorites. How exciting to have a picture of this Schmitt family member! I have seen a photo of Emile’s sister Christina and there is definitely a family resemblance. One phrase from this article drew my attention, “…surrounded by his loving ones.” I wonder who these “loving ones” were? Emile’s wife predeceased him. None of his siblings are mentioned in his obituary or his will. His children attended boarding schools. In his will Emile named a friend and neighbor as guardian of his children. This seems strange to me; he had several sisters and many other relatives who lived nearby. Why weren’t they chosen? My attention is now turning to John B. Bobe. According to the 1900 census he is a retired widow living with three daughters. I can’t help but wonder – why was this man chosen to oversee a $25,000 estate left to Arthur and Alvina Schmitt in 1898? I think I’ll have to devote a little time to exploring the relationship between Mr. Bobe and Emile’s children. Maybe then I can set my sites back on those ancestors I’m supposed to be researching. Very curiously watching your work here! 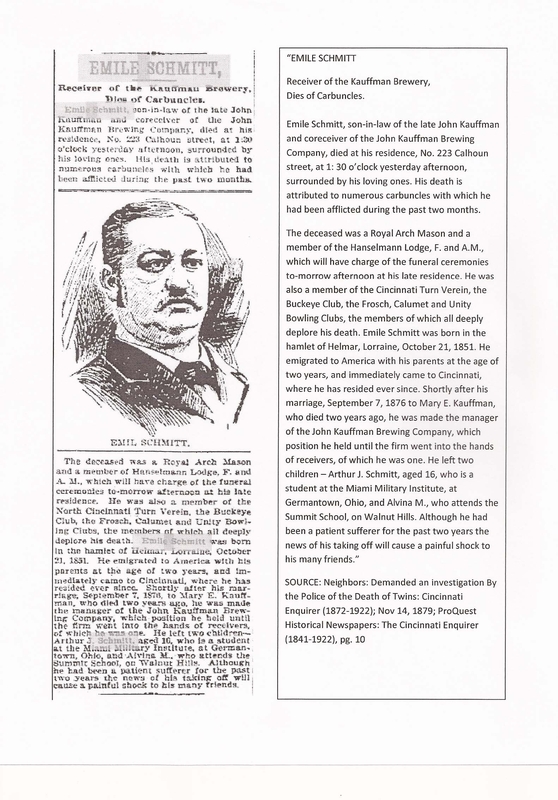 I am a Kauffman living in Cincinnati, Ohio and we have been trying to track our family lineage specifically as it might related to the John Kauffman Brewery that once existed in Cincinnati. Our family records are sketchy, but we think there might be a connection between our family and the brewing family! That’s exciting Josh! There is another Kauffman listed in some of the articles about Emile; a man who attended some of the same functions. Could he be Emile’s brother-in-law perhaps? I ordered Mary (Kauffman) Schmitt’s will and probate papers on the sixth of February. I’ll gladly share their contents as soon as they arrive. Please let me know what you learn about your connection to John Kauffman and the brewery, I’m eager to hear!